Having foot pain is never fun, regardless if it’s in the morning, afternoon, or at night. Whether you have plantar fasciitis, achilles tendonitis, or heel spurs, this sleeping stretch boot helps overnight to heal your foot. This versatile boot holds the foot in a dorsiflexion position, stretching out the fascia. While you sleep, it’s common for you to sleep with your feet pointed down causing them to tense up. 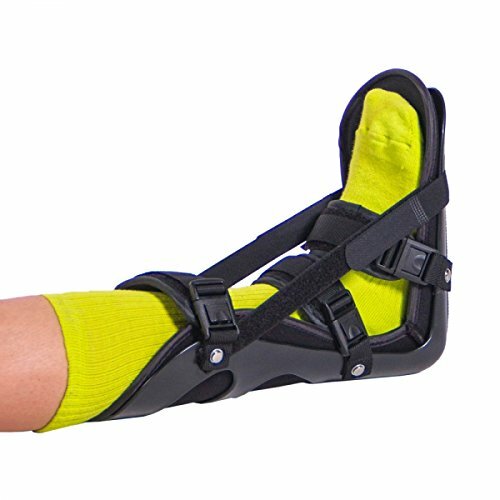 This soft plantar style boot helps remove any stress or tensing that your foot would endure while you sleep.This specific splint support also has a removable wedge feature, adding five degrees of elevation for that extra stretch. It’s great for plantar fasciitis, achilles tendonitis, and heel spurs because it produces a light stretch of the Achilles tendon and calf, preventing the tendon from tightening up. Without the flexibility in your calf muscle, your foot will not bend up towards the need as easily as it should. This boot’s breathable and comfortable material makes sleeping through the night bearable. It has a non-slip tread on the bottom allows you to easily move around at night if you were to get up. It comes in size small, medium, and large, so it’s easy to find the perfect boot for your specific foot size. The easy velcro straps makes securing the boot simple and allows you to tighten it for your maximum comfort. Measured by US shoe size: MEDIUM fits women’s shoe sizes 8-10 and men’s shoe sizes 7.5-10. Stretching night boot helps stretch the plantar fascia, calf, and achilles tendon while you sleep. This night splint has a soft, padded, nylon lining giving it extra comfort. Color = Black. Fits both left and right foot. HOW TO USE: Wear throughout the night while you sleep for 4-6 weeks until your daytime pain decreases. You will feel discomfort, especially during the first few days of use as you get accustomed to the stretch. (This means it is working!) Start at a 90 degree neutral position, then gradually tighten the straps each week to increase the amount of tension and stretch.